Microsoft today reaffirmed that its relationship with HTC is a “great” one, despite the fact that the Taiwanese company hasn’t been very involved with the Windows Phone scene lately (releasing only one WP device last year, and none this year thus far). Nick Parker, Microsoft's vice president of OEM partners, reportedly confirmed that “new things” from HTC are coming. According to CNET, Parker talked about HTC at a Microsoft press conference held at Computex 2014 today. Unfortunately, details on exactly what we should expect from HTC haven’t been unveiled - but we guess that we’re going to see new Windows Phone 8.1 hardware. A couple of days ago, we heard about a so called HTC W8, which is supposed to be released by Verizon Wireless in the third quarter of the year. 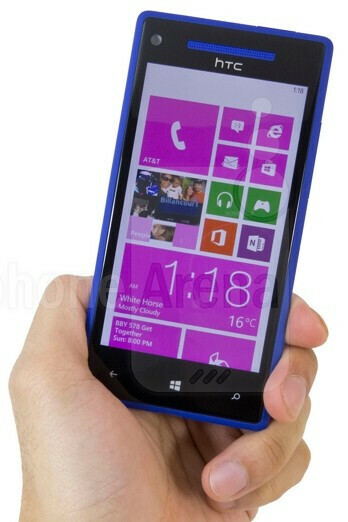 Reportedly, the W8 runs Windows Phone 8.1, featuring a metal design, BoomSound speakers, and a Duo rear camera. We assume that this is included in the new things that Microsoft was telling us to expect from HTC. For the moment, we don’t know if the HTC W8 will be a Verizon-exclusive handset. However, if that’s the case, HTC will probably want to launch a Windows Phone 8.1 device for the rest of the world, too. But we'll see what happens later this year. P.S. : the smartphone pictured above is the HTC 8X from 2012.
hope its not more bla bla bla. HTC should take advantage of what others android manufacturers dont. Readjust HTC SENCE so every single htc phone can be updated to KITKAT and tell people that all of HTC phones can receive the latest update, unlike samsung and others. maybe it works. get a 8 megapixel front facing camera. offer xmen, marvel or dc superheroe phones. offer 2 years warranty on them and dont confuse ur customers with htc one, htc one max, htc one x or htc m8. make it easier, not everyone is a geek! LOL!!! I have to chime in on you. No one can smash WP anymore. Not by a long shot. You sound like you just got your 1st smart phone & it's android KitKat. Good for you. But really The play ground is big enough to let everyone swim freely. FYI KIT KAT will be replaced as well at some point. HTC W8 with 3mp ultrapixel camera. They should change their slogan to "smaller the sensor, better the photo." i see what you did there ;) ! Shut up and take my money HTC! Hopefully the extra cash from Microsoft will help HTC stay afloat. Hopefully... HTC has had some amazing devices over the years. It is a shame seeing competition dwindle. M8 FOR WP8????? YEEEEEEEEEAAAAAHHHH!!!! MY DREAM HAS COME TRUE!!!! SCREW YOU APPLE, SAMSUNG AND GOOGLE!! I GOT MY MICROSOFT, NOKIA, AND HTC!! Honestly, the HTC 8X was a great device - hardware wise. Now that Microsoft has obtained Nokia Devices division, hopefully the attention to software from other OEMs can increase. Also with the OS maturing, I am hoping that OEMs will beef up their software collection (which seems to be happening.) More hardware = more choice = better for consumers!